The quality of life for all our in-home healthcare clients is the guiding principle for our organization. Our staff’s overall mission is to provide services enabling the wellness, dignity, safety and care of the elderly and seniors in their home. We provide families and caregivers with the help and support they need to have peace of mind regarding the care of their loved one. We strive to be the area’s and the nation’s premier in-home health care provider. Our due diligence is to select health care personnel who first and foremost are professional, thoughtful, helpful and compassionate. 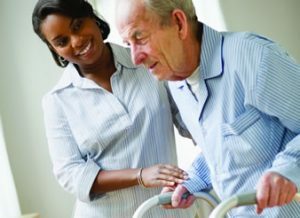 We pay particular attention to and verify required training as a Personal Care Assistant or Certified Nursing Assistant. The training is essential to our client’s wellbeing. All of our personnel receive training and are experienced in the following. Our staff helps loved ones with activities they now find difficult such as ADLs. Bathing: personal hygiene and grooming. Toileting: continence-related tasks including control and hygiene. Eating: preparing food and feeding. We understand the importance of having a person in your loved ones home who not only provides health care, but is good company and helps your loved ones remain in the community and be as active as possible. 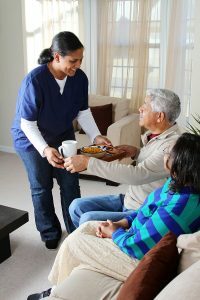 At the core of our mission for in-home health care services are to help individuals to improve function and live with greater independence; to promote your loved one’s optimal level of well-being; and to assist participants to remain at home, avoiding hospitalization or admission to long-term care institutions.